Cowpea, a protein-rich legume crop, is immensely important in many parts of the world, particularly drought-prone regions of Africa and Asia, where it plays a central role in the diet and economy of hundreds of millions of people. Cowpea provides food that complements starchy staple crops such as corn, cassava, sorghum and millets to offer a well-rounded diet, much as beans and other grain legumes complement maize- and rice-based diets in Latin America and other places. 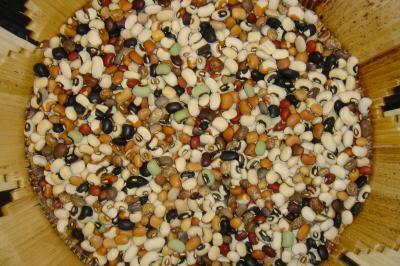 Due to its hardy nature, cowpea plays a key role in sustaining food security for both people and their livestock. 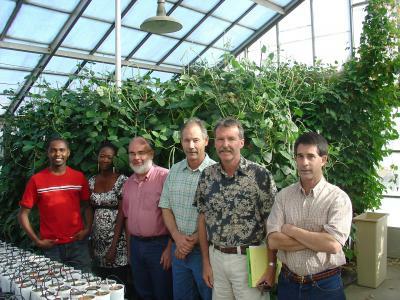 Now a team of scientists at the University of California, Riverside has responded to this challenge by developing a high-density "consensus genetic map" of cowpea that accelerates conventional breeding severalfold and facilitates the production of new varieties of not only cowpea but also other legumes, particularly soybean and common bean (near relatives of cowpea). "The consensus map is a consolidation of six individual genetic maps of cowpea, and is far more representative of the cowpea genome than earlier maps," said team leader, Timothy Close, a professor of genetics in the Department of Botany and Plant Sciences. "We now have a reliable, powerful tool that marks a paradigm shift in crop-breeding technology." Study results appear Oct. 13 in the online early edition of the Proceedings of the National Academy of Sciences. "All you need is a marker near a gene of interest," explained team member Philip Roberts, a professor in the Department of Nematology, who currently leads UCR's Bean/Cowpea and Dry Grain Pulses Collaborative Research Support Program — a highly successful project, supported by the U.S. Agency for International Development, that has assisted African institutes in developing improved cowpea varieties. "With a marker-based map we can look into any trait desired in cowpea. The resolution of the map is such that we can accurately locate the position of genes that are contributing in a major way to various traits we'd like to see built into new cowpea varieties." "A good number of genes are conserved across species," he said. "By looking at a marker on a cowpea chromosome, we can cross reference it to information on, say, the soybean genome, based on the DNA sequences of the marker. This facilitates knowledge transfer between these species, so advances made in cowpea can be translated into valuable information for soybean, and vice versa. The result is a tremendous acceleration in marker development to support the breeding process." "It took us nearly ten years to breed 'California Blackeye No. 50,' our newest blackeye cowpea variety for California growers, using conventional breeding methods," said Jeff Ehlers, a specialist in the Department of Botany and Plant Sciences with more than 20 years of experience conducting genetic research on cowpea in California and Africa. "With the new technologies and map information now at hand this could have been done in half this time. The new consensus map will greatly expand our ability to locate valuable genes and incorporate them into new varieties."